Everybody has them: plants someone else considers to be ineradicable, hateful weeds,but which you find tolerable--even desirable. 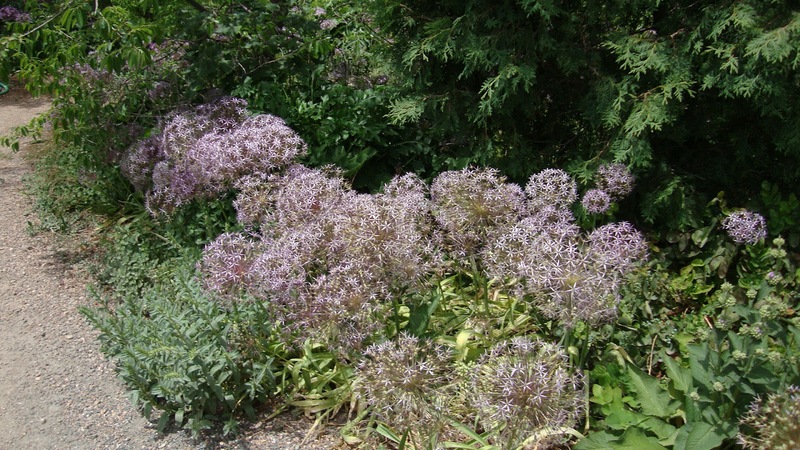 My list of these is very long: I begin with the Star of Persia (Allium christophii or albopilosum), which my colleagues at Denver Botanic Gardens have come to almost detest. If you are lucky (as I have been) you can occasionally find large mounds of these that have been removed in early summer once they bloom--bulb and all! You pay many dollars apiece for these mail order, but Denver Botanic Gardens carts out thousands almost every year (do the math! )...at my garden they are very manageable: I water so little the seedlings don't proliferate as much as I would like. Location location location! Here is my sad, lonely single specimen of Alyssoides graeca, another wonderful self sower--below you can see a small part of a huge patch on the conifer berm at DBG. I have planted my single plant on a nice slope alongside other rather challenging plants: but not one seedling! Hardly lives up to billing as a weed--but I know it can be! 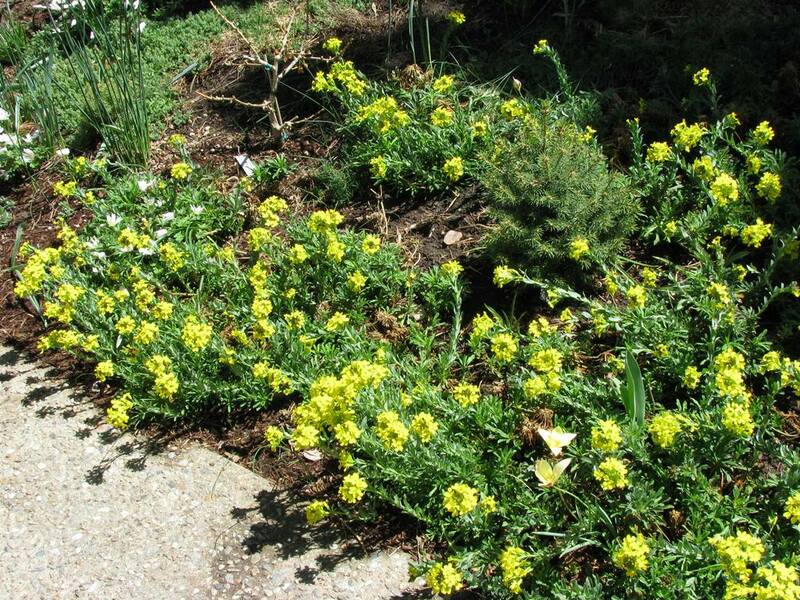 I have seen Asarina procumbens, the wonderful groundcovering snapdragon from Spain, be positively weedy in the Eastern United States--self sowing wildly in shade or sun. For some strange reason, Denver (where we generally grow Mediterraneans much more easily than they do in the East) I find it only grows in crevices--and sunny ones at that. Go figure. I am patiently waiting for it to reveal its wooly, weedy heart. So far I am disappointed--it is very demure for me indeed! Euphorbia epithymoides is usually considered relatively well behaved, and so it has been in my garden where this one clump is all that seem to ever have. But Sabine Schaffner in Boulder has dozens of husky clumps and endless seedlings showing up. I have read that it is considered invasive somewhere--but I personally doubt it! If so--get me a few more of those pests for my yard! I think I like it even more in fall when it turns a blood red for weeks. Gazania linearis is universal in the Drakensberg--and I have seed a few gardens where it has made itself a tad too comfortable. Greg Foreman at Kendrick Lake had all of them removed a few years ago (and there were hundreds if not thousands)...I noticed a few have snuck in again! This is so easy to remove, I don't think it shall ever pose a menace--and with flowers like this for months on end, who could live without it? Yes, Virginia. Pasqueflowers(Pulsatilla vulgaris) can be weedy. One of the few mandates I have been subjected to at my work was to "remove all those pasqueflowers": the year was 1984 and there were massive clumps of pasqueflowers in almost every bed at DBG Rock Alpine Garden, by the hundred and thousand. It took dozens of wheelbarrowloads to get them all out....and yes, they have crept back. But watch out--it could become a ravishing weed again! And finally, bulbs: everyone knows how Muscari can take over the joint. 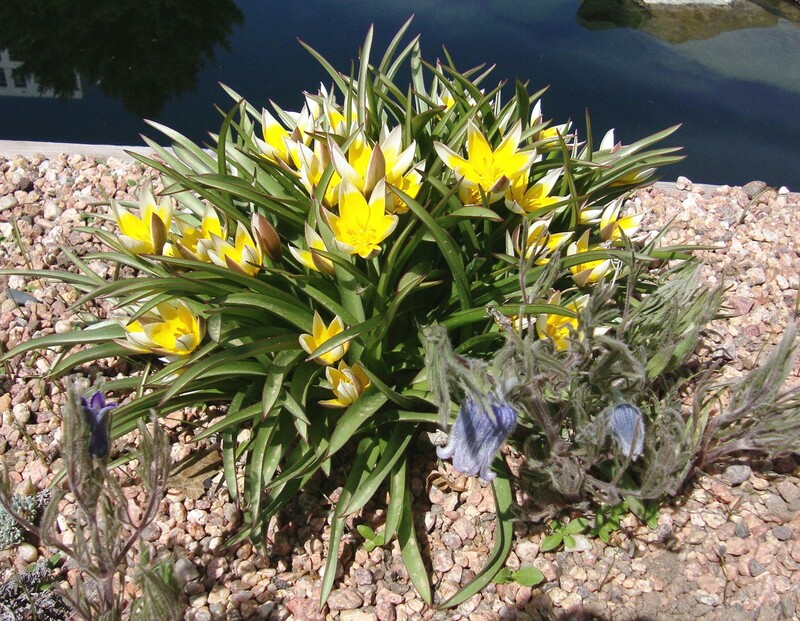 But in Colorado many tulips self sow, but none with the vim and vigor of Tulipa tarda. Sandy Snyder (that's her meadow below) actually mows them when the seed pods are still green to try and restrain them.. These and a number of their quasi-weedy cousins are mainstays for me, and think more gardens should have their share of mild-mannered but slightly rowdy guests--I mean weeds. If you visit DBG in late May and June you will see that it could be renamed "Persian Star Botanic Gardens"--although "Foxtail Botanic Gardens" is just as appropriate that time of year! 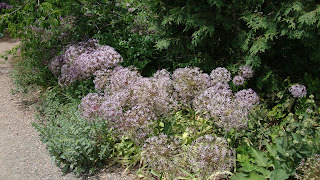 I have Allium christophii in a part of my yard that gets no irrigation and they still have become quite weedy. I yank scores of them out of my rock garden every year. Send them our way! One person's weed is another's treasure...Scott Weber and I will duke it out for them! Gosh, I wish Gazanias would grow like weeds in my garden! I can grow them, but only with a lot of protection from the winer wet and frosts.